Some autistic kids have a very restrictive diet. He eats pretty much everything. Except tomatoes. Due to his sensitivity issues Edward doesn’t get the same kind of sensory feedback that most of us do and throughout his childhood he never seemed to have any awareness of having food on his face or hands, (or at least if he was aware it certainly did not bother him). Edward like a lot of autistic kids has hypermobility and consequently his fine motor skills were poorer than most of his peers. Using a knife and fork when you have hypermobile finger joints is challenging – it’s easier and quicker to just dive on in with your hands. That’s fine for finger food but Christmas dinner or spaghetti bolognese is hardly going to be a clean affair if eaten with fingers. To protect their clothing our kids all wore bibs/aprons at meal times when they were little. When the twins came along we used to bib up both of them and Edward every single meal time. Then one day we realised that the twins weren’t really making a mess anymore and so their bibs came off but Edward, 3 years their senior, was still getting food smeared all over the place. His bib stayed. For years. Despite being provided with easy grip cutlery Edward would invariably end up eating food with his fingers and then proceed to wipe his greasy fingers on his clothing or the furniture or the person sitting next to him! It bothered all of us but especially his granddad who we strategically sat as far away from Edward as possible when he visited. I remember once sternly saying, “Edward, knife and fork!” and him looking at me completely baffled – I realised later that my reminder made absolutely no sense to him. I should have said, “Edward stop eating the food with your fingers, use your fork to put the food into your mouth”. Saying exactly what you mean (even if it means using a lot more words) can make it easier for autistic children to understand you. I’m not sure exactly when it happened but Edward no longer makes a total mess at the dinner table. People no longer have to summon up their courage to sit next to him. His table manners are far from impeccable but they are certainly satisfactory and probably very much on a par with the average teenage boy. At this time of year we are bombarded with images of happy families sitting down to a lovely christmas dinner but I wonder how many families actually achieve anything vaguely resembling this. 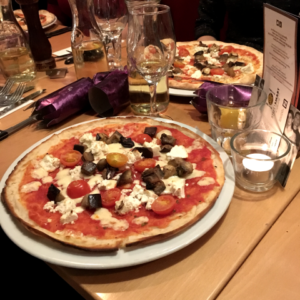 Friends of mine once served up pizza for their kids on Christmas day and having tucked up their young offspring in bed for the night they sat down to a calm and relaxing Christmas dinner for two. How wise! My kids all like a good roast dinner and so Christmas dinner is like the king of all feasts to them. The only thing that will be different between Edward and the rest of us is that he will eat his food in a very precise order. No combining different foods together in one mouthful for him! He’ll eat his least favourite items (brussel sprouts) first and save the best (pigs in blankets) for last. Whether you have pizza or turkey and all the trimmings. Whether you are eating with kids or waiting until they have gone to bed I hope you have the chance to enjoy a slap up meal or two over this Christmas period. 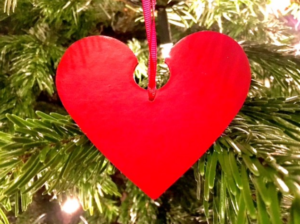 Fab post about christmas meal and related problems lynne, very informative and helpful. Enjoy the Christmas Season with you and yours. Thanks for your comment. I think Edward is an amazing young man but I am obviously completely biased x Have a lovely pizza eating Christmas. Very interesting and well observed as usual. We have wondered for a longtime why my son has made a lot of mess eating, and we recently found out he has hyper mobile joints. It makes sense now! 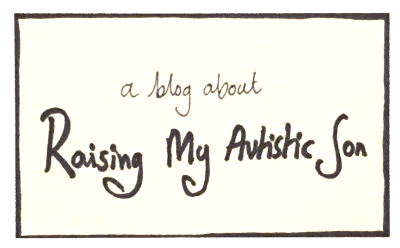 As an autistic person totally identity with food and sensory. So me food I can not eat or it will make gag such as banana, I don’t like slimmy textures. But could quite happily eat certain food such as bread or a dame bar till the cows come home as I love it so much.